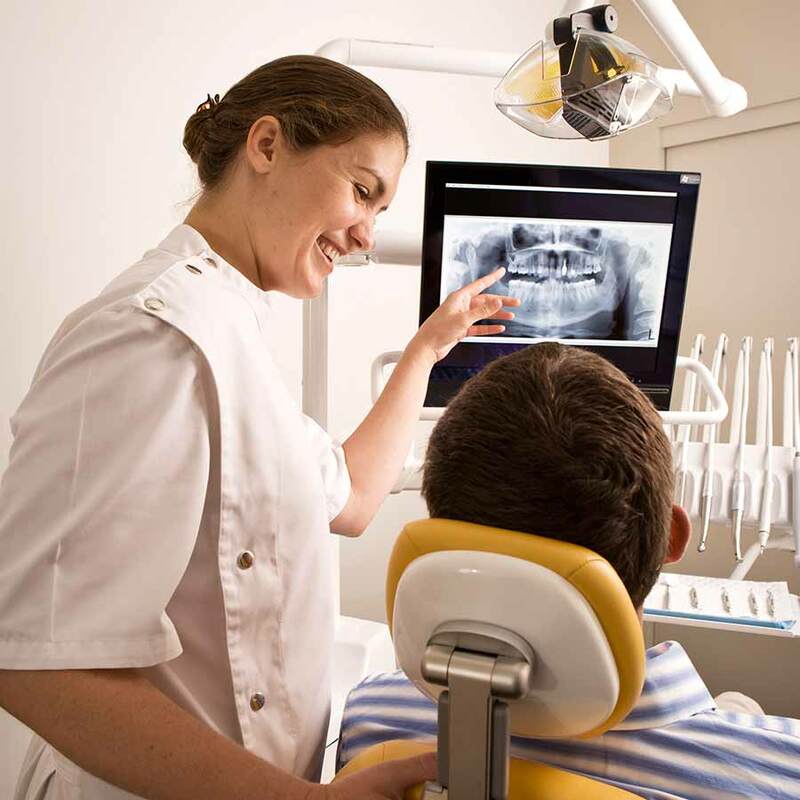 It's almost impossible to imagine the practice of dentistry without x-ray technology. Radiographs (x-ray pictures) allow orthodontists to diagnose and treat problems not yet visible to the naked eye, including early tooth decay, gum disease, abscesses and abnormal growths. There is no question that since x-rays first became available a century ago, this diagnostic tool has prevented untold suffering and saved countless teeth. Now, state-of-the-art digital x-rays have made the technology even safer and more beneficial. Digital x-ray technology uses an electronic sensor to capture an image, which can be called up instantly on a computer screen. When digital x-rays first became available about 20 years ago, they immediately offered a host of advantages over traditional x-ray films, which require chemical processing. Most importantly, they cut the amount of radiation exposure to the dental patient by as much as 90%. While faster x-ray films have been developed over the years that require less exposure, making that difference less dramatic, a digital x-ray still offers the lowest radiation dose possible. Minimal Use Of Radiation - With digital technology, the amount of radiation exposure is drastically reduced, making the process safer for both kids and adults. No Wait Time - Instead of waiting for the x-ray film to develop, the image is available immediately on the computer screen for Dr. Mojdehi-Barnes to examine while the patient is in the chair. Higher Quality Images - With digital x-rays, your orthodontist has a greater degree of control over the image, with the ability to enhance the image or increase the contrast, making it easier to spot potential problems. It's even possible to compare the x-rays side-by-side in an instant, making even the minutest changes to your tooth structure easier to detect. No Chemical Processing - Since there is no film being used with digital x-rays, that means there are no more toxic chemicals necessary to develop that film, helping protect the environment. Easy Sharing & Storage - Instead of having to deal with physical prints of your x-rays, digital x-rays can be easily transferred electronically through email or other means, which also decreases the chance that a valuable x-ray is lost or misplaced. While digital technology has minimized the health risks of x-rays, it has not entirely eliminated it. X-rays are a type of radiation used to penetrate the tissues of the body to create an image. In doing so, there is always a slight possibility of causing changes at the cellular level that might lead to future disease. Of course, there are sources of radiation present in the daily environment—the sun, for example—that can also cause disease. It's important to note that the chance of this happening is thought to be cumulative and not based on a single exposure. Still, x-rays are not considered risk-free regardless of how technology reduces your exposure. That's why dentists will only use them when the benefit of obtaining better diagnostic information outweighs the procedure's small risk. This is particularly true of computed tomography or CT scans, which can raise the level of exposure, yet yield a tremendous amount of information per scan. No matter which technology is being used, each case is considered individually, and your safety is always paramount. If you have questions about why an x-ray is being recommended for you, please feel free to ask. Dr. Maryam Mojdehi-Barnes proudly provides professional orthodontic care to patients of all ages so they can enjoy a healthy smile for years to come. For more information, please contact us or give us a call at (972) 390-1100. You can also schedule an appointment using our online appointment request form. We look forward to seeing you in our office soon!